Well more like 90 days late! But I always believe better late than never, particularly in this case. 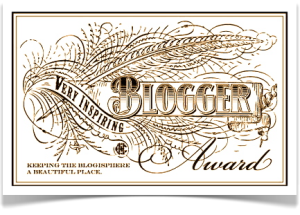 Our multicoloured life nominated me for an Very Inspiring Blogger award. I’m always blown away when someone thinks I’m doing ok. According to many I have the most ridiculous sneeze. They come at machine gun speed and never in batches of less than five. Close friends have accused me of being a sheep that needs drenching! Everyone of my lecturers at University stopped class at least once to check if I was ok.
Every summer I grow basil in our courtyard and make my own basil pesto – delish! As a child I used to occasionally brush my teeth using my left hand in case I broke my right arm! Spring is my favourite season of the year, the buds on trees, that sense of a fresh start. I would still splash in puddles in my bare feet! Congratulations on your well-deserved award! I enjoyed learning more about you in the Q & A session. I think it’s fantastic that you grow basil in your courtyard. It’s also one of my favorite herbs to cook with. Thanks again for the gracious nod to my blog. Hope all is well in your part of the world! Thank you for the nomination!! I am flattered. Thank you for the award, very much appreciated. I have done the honours.